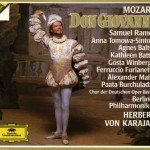 This sumptuous Giovanni is one of the opera’s most popular recordings. Indeed, the few critics who dislike the classic 1959 Giulini Giovanni often site this one as their favorite instead. While I don’t fully agree with them (I adore the Giulini recording, which to my ears has endless sparkle while this version occasionally lapses into languor), this recording is a definite favorite of mine as well. The voices of its starry cast are, admittedly, warmer and richer than those on Giulini’s recording, and under the seasoned baton of Herbert von Karajan, the score glows and dances majestically. True, with its grand-voiced modern orchestra and constantly slow (though by no means uniformly slow) tempos, this performance is very much Romantic Mozart, rather than light, airy, “18th century” Mozart. But with near-constant beauty and dramatic force, it’s Romantic Mozart at its best. Samuel Ramey’s Don Giovanni is a true seducer from beginning to end, with his lush, darkly silky, elegantly rumbling bass-baritone. What he lacks in sheer passion and ferocity he makes up for in dignity and suavity. Perhaps the true star however, is Ferruccio Furlanetto’s outstanding Leporello: his performance flows with life, humor and humanity, and is sung with a rich, dark bass, fairly similar to Ramey’s yet with just enough earthy rasp to distinguish servant from master. Anna Tomowa-Sintow sings Donna Anna with a luxurious tone that shines in her dramatic passages (only for “Non mi dir” is her voice a bit heavy), and is well accompanied by the caramel-sweet lyric tenor of Gösta Winbergh’s Don Ottavio. Agnes Baltsa, meanwhile, is a potent, passionate Donna Elvira, her fruity, sensual mezzo conveying a perfect blend of rage and vulnerability. I only wish Karajan had chosen a less breakneck tempo for her “Mi tradí.” Kathleen Battle’s enchanting, silver-toned Zerlina perfectly rounds out the trio of women, while Alexander Malta is a solid Masetto, though his heavy, gravelly voice is oddly mature for a character usually cast as a fiery young whippersnapper. Last but far from least, Paata Burchuladze is a luxuriously thunderous-toned Commendatore: I must admit, though, the squawk he utters when “stabbed” in Act I is beneath the character’s dignity. 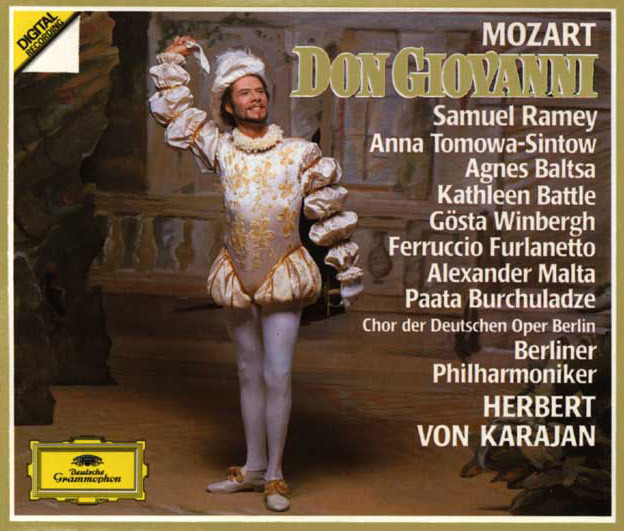 This may not be quite my definitive Giovanni, but still, its sweetly lush sound world and dramatic vitality make it one of my top recommendations. No devotee of Mozart’s operas, Romantic-style or otherwise, should pass it by.